Following in the footsteps of North Carolina, N.C. State is bringing a successful ‘mid-major” coach to Raleigh hiring Dave Doeren of Northern Illinois to be there new head coach. Doeren is finalist for the 2012 National Collegiate Coach of the Year Award, has guided No. 18 NIU to a 12-1 record and a BCS buster birth in the Orange Bowl against Florida State. “Coach Dave Doeren is a highly motivated overachiever who shares our goals to pursue aggressively a high level of achievement in the classroom and on the field of competition,” stated Yow. 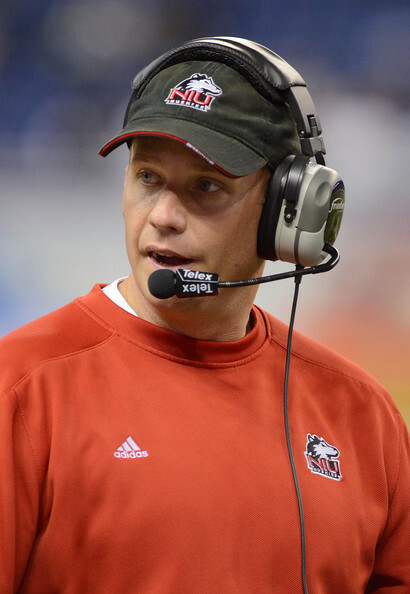 Doeren’s overall record at NIU over two years as head coach was 23-4 and 17-1 against Mid-American Conference (MAC) opponents. This season, Doeren led the Huskies to a school-record 12-win season that came on the heels of an 11-win season in 2011. With his recent win over Kent State, he captured his second MAC championship. NIU is the only NCAA Football Bowl Subdivision team to win 21 of its last 22 games. In his two seasons at the helm, Coach Doeren’s prolific offense scored 40 points or more 16 times in 27 games. This season alone, the program scored 40.8 points per game and is in the Top 15 nationally in 4th down conversions (2nd), rushing offense (9th), scoring offense (10th), 3rd down conversions (15th), and total offense (15th).